Do jellyfish give you the wobbles? 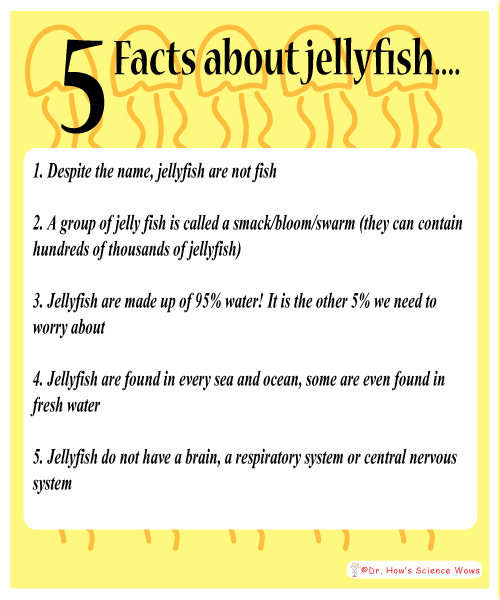 Jellyfish have been getting a lot of attention recently for all the wrong reasons. The news was afloat (pardon the pun) last week of deadly jelly fish off the Dublin shores. Red flags were raised and warnings were put in place on certain beaches as lion mane jellyfish (cyanea capillata) were spotted in the water. We had our own jelly fish encounter on holidays a few weeks ago. Both my husband and brother got stung on a tiny beach off the south east coast of Mallorca. The culprits were small and innocent looking but still came with a real sting in their tail (puns are really flying today). 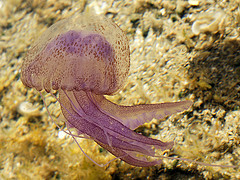 They were the Mauve Stinger (Pelagia noctiluca) jellyfish and both men got stung on their arms… they managed to bite back the tears but they were definitely in pain. It took most of the day for the swollen ridges to recede. We were very lucky as these small jellyfish came right to the shore. My brother was stung within seconds of entering the water, in a place that our children had been swimming in just a few minutes before. Although we encountered these in the Mediterranean, they are, in more recent years, not uncommon in Irish waters. In November 2007 a large swarm of mauve stingers, about 16 km in diameter, completely wiped out more than 100,000 fish from a Salmon farm off the coast of Belfast, Northern Ireland. HOW DOES A JELLYFISH STING WORK? Apart from the pain element, the stinging process of the jelly fish is remarkable and quite unique. Many jellyfish have tentacles that contain thousands of tiny nematocysts – these are cell like capsules that contain venom and a hallow, coiled, barbed tube. When triggered the coiled, bard tube is shot into the body of the prey and the venom is released. WHICH IS THE MOST DEADLY JELLYFISH SPECIES? Certain species of the Box jellyfish are considered the most deadly in the world, producing a toxin that attacks the heart, nervous system and skin cells. A sting from a Box jellyfish can prove fatal for humans, often due to a heart attack from the shock and pain. WHAT SHOULD YOU DO IF YOU GET STUNG BY A JELLYFISH? ARE JELLYFISH THE CURSE OF THE SEA OR AMAZING CREATURES WITH A LOT TO OFFER? They certainly seem to cause a lot of bother and pain to humans but is there a “good side”? Some of the problems may be due to increased numbers of jellyfish. Is there really an increase in jellyfish swarms and what does this tell us about the seas in which they live? A KEY TO THE HEALTH OF OUR OCEANS? 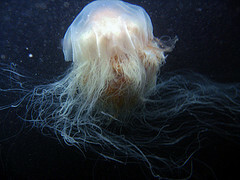 There have been a number of large swarms or blooms of Jellyfish reported over the last few years. Scientific studies and surveys are ongoing to determine if what we are seeing are just natural ebbs and flows in the jellyfish population, or an annual and steady increase in numbers. Some feel that factors such as overfishing (removal of natural jellyfish predators) or human pollution of our oceans (increasing algal growth and plankton… jellyfish food) are causing a steady increase in jellyfish numbers. Others feel climate change is a factor. Perhaps what we are seeing is just a natural peak in the jellyfish life cycle. Time, and further research will tell, but the monitoring of jellyfish numbers will give us more insights into the state of our oceans. It would appear that jellyfish play an important part in the story of evolution. Genetic sequencing and fossil dating have changed the evolutionary tree somewhat, with suggestions now that the comb jelly (a relative of the jellyfish) may be the earliest divergent animal lineage. These studies put the comb jelly in existence some 600 million years ago. Did we all evolve from a lump of jelly? The question has certainly made the evolutionary tree wobble, shaking a few of it’s branches. A SOURCE OF INSPIRATION AND INVENTION? Although jellyfish are carried by currents they can also move propel their bodies upwards in a pulse like motion. The shape and movement have been the inspiration in the design of a new lightweight robot. What is particularly remarkable is that the robot moves through air, not water. Most jellyfish live for about a year, some species have much shorter life spans but there is one, called Turritopsis nutricula, that is effectively immortal. It has am amazing ability to revert back to an earlier phase of it’s life cycle under certain conditions. Commonly called the “Benjamin Button” of the ocean, it has naturally caught the attention of the worlds of science and medicine, inspiring advances in stem cell research and regenerative medicine. Some species of jellyfish, including the Mauve Stinger mentioned above, are luminescent. The gene responsible for this luminescence, and the luminescent protein it encode have been used by scientist and medics in a variety of research areas from crop advancement to cancer diagnosis. You have to admit, this certainly sheds new “light” of the humble jellyfish. Despite their threat, jellyfish are certainly very interesting, unique and inspiring animals. Are you convinced or does the thought of them still make you quiver? ?